Ford Motor Company's Kansas City Assembly plant in Claycomo, Missouri is a Ford Motor Company assembly plant located at 8121 US-69, Kansas City, MO. The plant currently consists of 4.7 million square feet of production space and employs approximately 7,000 hourly workers represented by the United Auto Workers Local 249. The plant currently produces the Ford F-150 and the Ford Transit. It is the largest car manufacturing plant in the United States in terms of units produced. The plant is about 10 miles (16 km) northeast of the Kansas City, Missouri city center. Since its opening in 1951, the Ford Claycomo Plant, as many in the Kansas City area call it, has generated thousands of jobs, millions of tax dollars for the otherwise minor suburb, and is the largest tax generator in Clay County, Missouri. The 4,700,000-square-foot (440,000 m2) on 1,270 acres (5.1 km2) facility employs approximately 7,000 people. In addition to the main final assembly plant, KCAP also includes a stamping plant for the Ford Transit, a separate body shop and a separate paint shop for the Ford F-150. Plant tours were discontinued on September 12, 2001. 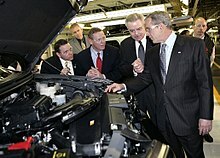 In December 2010 Ford announced it was moving the Ford Escape and Ford Escape Hybrid to the Louisville Assembly Plant, which underwent $600 million in renovations. The move stirred fears that it could result in the loss of half the jobs at the 3,700-person plant. Missouri had been anticipating changes at the plant. In 2010 it passed the Missouri Manufacturing Jobs Act providing tax incentives for companies that invest in plants in the state by allowing them to keep employee withholding taxes. While the bill would benefit all industrial businesses it was specifically targeting the plant and was introduced by Jerry Nolte, whose district includes the plant. Ford could save $150 million over 10 years if it invests in the plant. The bill had been the subject of a filibuster by United States Senate candidate Chuck Purgason who objected to the favoritism extended to Ford and read aloud sections of Allan W. Eckert's The Frontiersman into the record. A day after the announcement of the move of the Escape, Ford said a yet to be announced line would replace the Escape. In 2011, Ford said it would spend $1.1 billion on additions and upgrades, including a new stamping plant. In 2012, it was announced that the plant would be the North American lead production site for the new Ford Transit, which replaced the now discontinued Ford E-Series vans. ^ St. Louis Business Journal - by James Dornbrook (2010-03-14). "Ford to move Escape work from Missouri | St. Louis Business Journal". Bizjournals.com. Retrieved 2010-12-10. This page was last edited on 10 November 2018, at 07:34 (UTC).